I have found a lot of people on the internet those some how got to know how to download movies and games from the internet from free downloading websites but they don’t know how to join the archive files. (I mean the downloadable files are usually splitted into 100mb parts. i.e. for example a Ripped movie is of 700mb size, then it will be broken down into smaller 7 pieces of 100mb each. Then you need to join those 7 files to get back the original single 700mb file.) 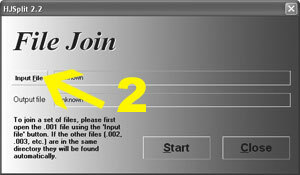 The uploaders use two different techniques most commonly to split the files into 100mb archive. Either they use the file splitting tools like HJSplit or they use WinRar. The reason of splitting the files into smaller parts is that the free file uploading websites like Rapidshare, Megaupload, Easy-Share, etc. allow a limited size of the file to be uploaded. Gradually all the free uploading websites are increasing the per file limit of the filesize but still uploaders have to split the files. 1. 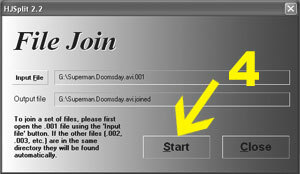 Make sure the files which you downloaded have exactly the same name as mentioned on the download page of websites. 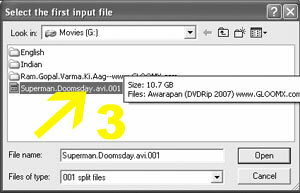 For Instance, I’m taking an example of a movie file (Superman.Doomsday.avi) that is 700mb and is divided into 7 archive parts using HJSplit. 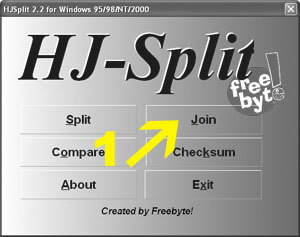 Following will the splitted file names of the archive which you will download. 4. and click the START button. 5. You will get your single file as output. Some people dont even know how to change the file extension. Please check my guide on How To Rename File Extension in Windows. I have written other guides too. Please check the How-To Guide category of my blog. You can check the famous guides like – How to Download Files from Rapidshare, How to Download Files from Megaupload and How to Download Files from Easy-Share.